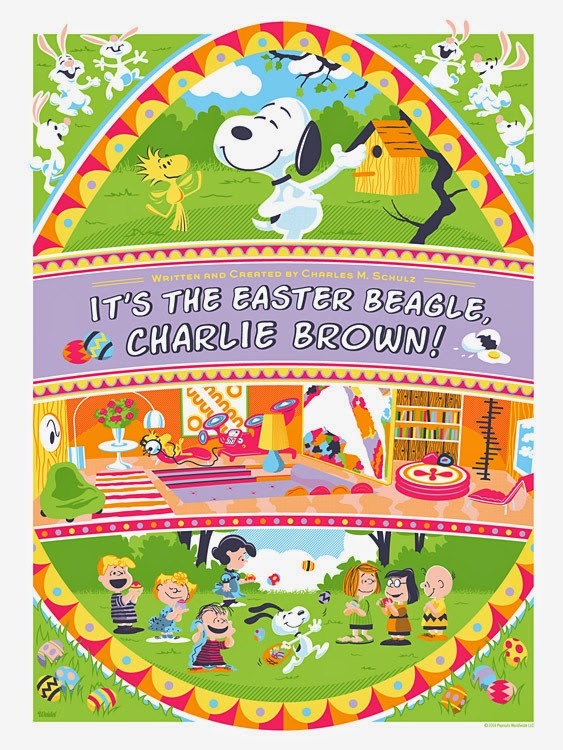 Spring is here, and so are two new eye-catching limited edition It's the Easter Beagle, Charlie Brown prints from Dark Hall Mansion, going on sale Tuesday, April 8. Artist Jayson Weidel captures the 1974 television special in two very different styles. The standard edition print sports cheerful colors and an nifty Easter egg motif encircling scenes from the show in great detail, including Woodstock's groovy birdhouse pad (one of my personal favorites). The variant print has a simpler but no less attractive design of the Easter Beagle himself bursting forth from a basket full of eggs, to the delight of two adoring fans. 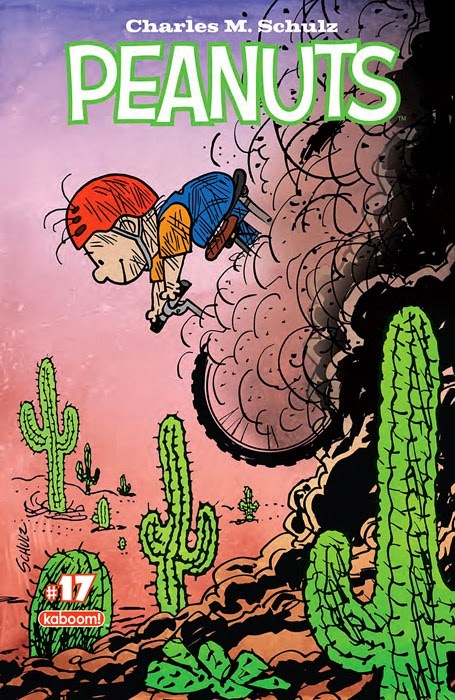 The officially licensed, numbered editions measure 18" x 24" and are individually screen printed. The standard edition will be limited to 280 prints, and the variant edition will be limited to 50 prints. In addition, there will be a special wood edition of 5 each of both the standard and variant artwork. 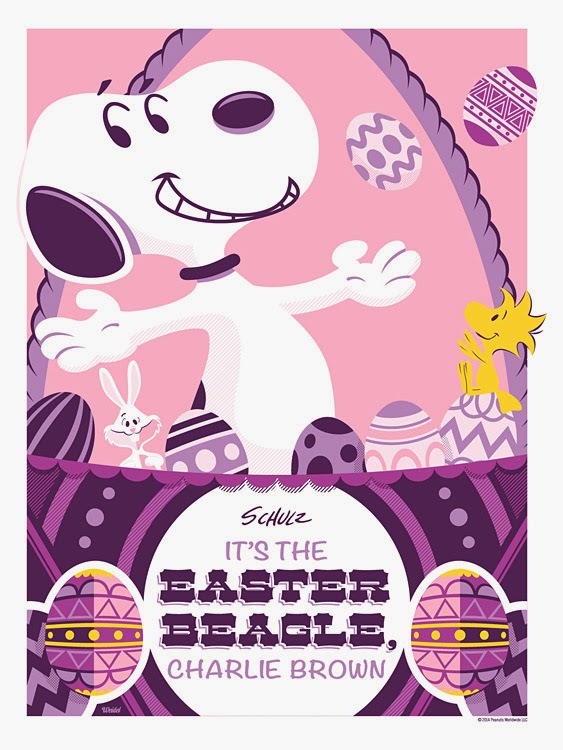 The 2014 Easter Beagle prints go on sale Tuesday, April 8, 2014 at at a random time between 9:30 AM and 11:30 AM (Pacific time) at Dark Hall Mansion's webstore. The Easter Beagle will be making a timely visit to television screens on Easter Sunday, April 20, 2014. ABC will be broadcasting the traditional springtime special It's the Easter Beagle, Charlie Brown together with the baseball-themed special Charlie Brown's All-Stars from 7-8 PM (Eastern/Pacific time). In 1974's It's the Easter Beagle, Charlie Brown, Linus tries to convince the gang that there's no need to decorate their own eggs, because the Easter Beagle will bring them - but given Linus' history with the Great Pumpkin, his friends are skeptical. Meanwhile, Peppermint Patty and Marcie (ignoring Linus' advice) go through a series of mishaps preparing eggs for coloring. Charlie Brown's All-Stars was the second-ever Peanuts television special, airing in 1966, just six months after the successful broadcast of A Charlie Brown Christmas. In this special, Charlie Brown tries to keep his baseball team together with the lure of getting actual uniforms and playing in a real league, but he faces a tough decision when he learns that the sponsor will only provide them if he takes the girls and Snoopy off the team.